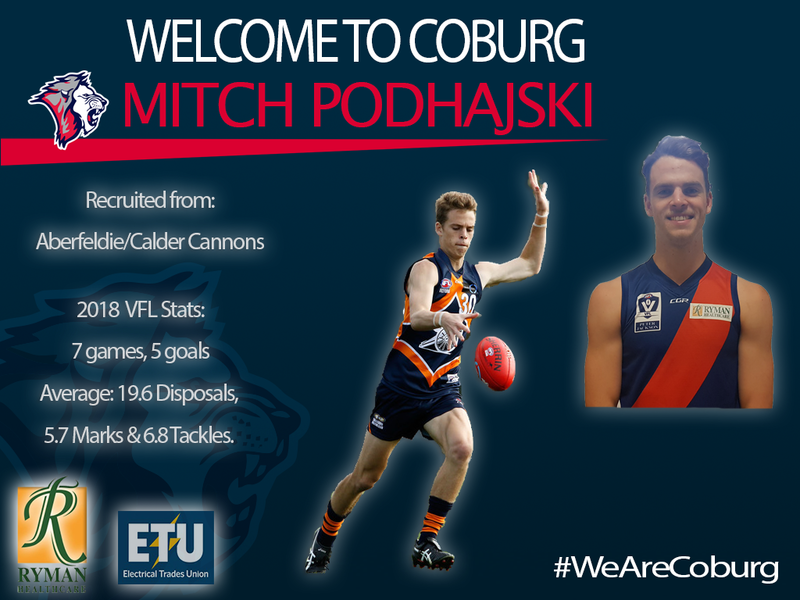 After having a taste of VFL action as a Lion this season, Calder Cannons’ Mitch Podhajski has committed to Coburg for 2019. From his seven VFL matches this year, Podhajski managed five goals, was named among the best on ground twice, and averaged five tackles and four marks per game. “I was very grateful for the opportunity Coburg gave me throughout the year, and although I thought I played well in a few of the games, I want to raise that standard and hold myself accountable for it,” he said. The “highly passionate players” and “equally supportive coaches and staff” are two things that appealed to him when deciding to sign at Coburg, and looks forward to taking his football to the next level. “I loved being around the footy club and playing, despite coming in underdogs most weeks,” Podhajski said. When he wasn’t playing for Coburg, Podhajski was busy co-captaining the Calder Cannons in the TAC Cup. Choosing to return as an over-age player after being overlooked in the AFL draft was a decision that paid off, rewarded for a stellar season by taking home the Robert Hyde medal as the Calder Cannons’ best and fairest player. Podhajski has found the preseason enjoyable, having put in a solid month of training with Coburg already. “I have really been focusing on building a good fitness level as well as getting stronger,” he continued. Also hoping to add to his tally of VFL matches, Podhajski is most excited to test himself against some of league’s more experienced players, as well as some of the AFL-listed opposition. “All the boys at Coburg and I share the desire to come into each week knowing we are all going to have to perform to get results,” he said. Podhajski joins Matthew Harman, Liam Whelan, Tom Meagher, Tyson Old and Tom Simpson to sign as Lions ahead of the 2019 season. To see Mitch Podhajski in action as a Lion next season be sure to click here and sign up as a 2019 member today!